Cloudtract is a cloud-based contract management solution for SMEs, entrepreneurs and managers that organizers all supplier and contract documentation. Cloudtract sets alerts for users to renew, negotiate, cancel or consolidate contracts, and stores all supplier and contract documentation for user access. With Cloudtract, users can receive reminders for contract renewals via email or online calendar appointments. Cloudtract centrally stores and manages all contract and supplier documentation in one secure environment. Administrative roles can be set to establish user management and control who is authorized to view or edit specific documents, whether individuals are within or outside the organization. The dashboard feature provide a comprehensive, at-a-glance view of customized alerts, metrics, notice periods, owners and end dates. Cloudtract works with existing contract management system to assist in transfer. 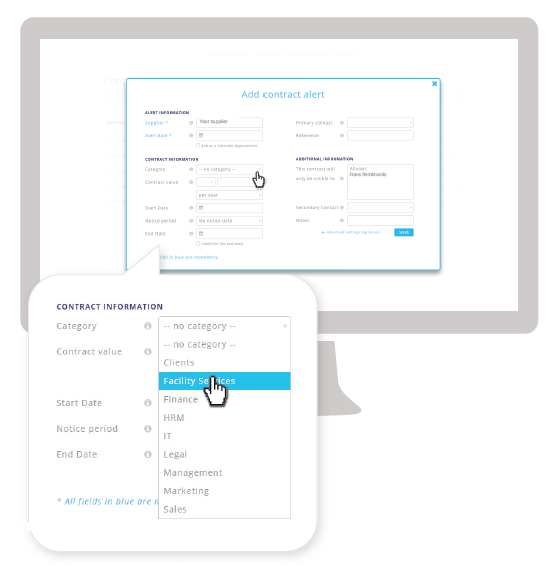 Import contract data from your existing spreadsheet and automatically create contract alerts in Cloudtract. Map columns and cells to sync the contract data of existing CSV file to Cloudtract. Cloudtract is used in more than 80 countries and supports 38 different currencies for accurate contract management. Everything in Cloudtract is automatically indexed and archived, and full-text search operators allow users to access contracts quickly. Cloudtract integrates with third-party apps like Exact Online, Slack, calendars and other online calendars to easily sync your contract alerts as scheduled tasks or appointments in your online calendar. Not sure if Cloudtract is right for you? Use our Product Selection Tool to compare other contract managment solutions. Have questions? Call one of our unbiased Technology Advisors for a free consultation. Learn everything you need to know about Cloudtract. Our experts will reach out to you shortly.